Do you want to help improve OIC/DC for the benefit of our students and our community? Please join the thousands of people and companies from the Washington, DC metropolitan area who support us. 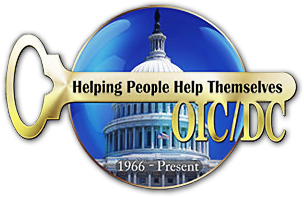 Read on to learn about OIC/DC volunteer opportunities and other ways you can support us. It takes the combined work of an entire community to really make change happen. We're always looking to recruit tutors, technology experts, administrative support workers, and more. Regardless of the skills you bring to the table, we'd love to have you on our team. Our graduates are people with great skills who want to work for you. We offer the same screening and referral services as an employment agency—at no cost to you. Contact us today, if you're looking to hire one of our graduates. Your gift will be spent carefully in order to have the greatest impact on people's lives. We happily accept check, cash, credit card, and stock gifts, and will provide you with a tax acknowledgment. Every day, our participants are thankful for people like you who help change their lives. We invite you to come by and meet these fantastic people. You'll see for yourself how much of a difference you can make!